Whenever you encounter some ideas that look like they might be related, it is super-important to mull them over until you understand just how they are related. Isoelectronic correspondence keeps the electron configuration the same. The Aufbau and Abbau processes keep the total charge the same. That is, the number of protons minus the number of electrons stays the same. Ionization keeps the number of protons the same. That is, the nuclear charge Z stays the same. The following sections discuss each of these things in more detail. The Aufbau principle states that to a good approximation, we can figure out the electronic configuration of each element in the periodic table by starting with the electron configuration of the previous element and adding an electron (while simultaneously adding a proton and some appropriate number of neutrons to the nucleus). The word Aufbau comes from German, and means literally “building up”. Since it is a German noun, it is always capitalized. For example, as shown in figure 1, we can construct sodium by adding an electron to neon (and changing the nucleus accordingly). Similarly we can construct magnesium by adding an electron to sodium (and changing the nucleus accordingly). It’s not always 100% obvious where “the” added electron goes. In the first two rows of the table, it gets layered onto the outside of the previous electron configuration. However, in general things are not so simple, as we see in the transition metals, the rare earths, and the lanthanoids. In principle, the same process works in reverse, although it is somewhat less useful. That is, we can start with sodium and remove an electron to arrive at neon. This is usually called simply “reverse Aufbau” although there is a perfectly good German word for this, namely Abbau, which means literally “building down” i.e. reduction. We now discuss things that have the same arrangement of electrons (even though they may differ in other ways). Suppose we remove an electron from sodium but do not remove any protons from the nucleus. This leaves us with a Na+ ion, as shown in the left part of figure 2. The Na+ ion has the same electron configuration as neon. Obviously Na+ and neon are not the same thing, but they are isoelectronic. To an excellent approximation, the energy levels in Na+ are related to the energy levels in neon by an overall scale factor. The energy levels are not the same, because of the difference in nuclear charge, but there is a one-to-one correspondence between levels. The same idea applies throughout the periodic table, as shown in figure 2. Na+ and neon are isoelectronic. 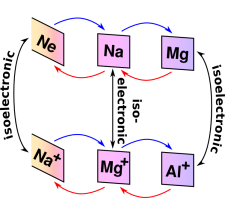 Mg+ and sodium are isoelectronic. Al+ and magnesium are isoelectronic. The same idea that we have just applied to atoms can also be applied to more abstract things, such as processes. 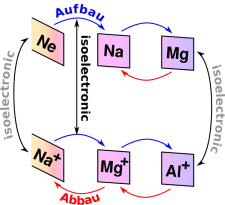 For example, the Aufbau process that takes us from neon to sodium is isoelectronic with the Aufbau process that takes us from Na+ to Mg+. This isoelectronic correspondence is labeled in figure 3. 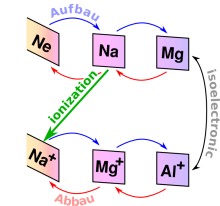 By the same token, the Abbau process that takes us from sodium to neon is isoelectronic with the Abbau process that takes us from Mg+ to Na+. For clarity, this isoelectronic correspondence is not labeled in figure 3. By convention, chemical entities are named according to their nuclear charge Z ... not according to their electron configuration. Therefore the Na+ ion is called a sodium ion, even though it is isoelectronic with neon. In the figures in this document, entities are color-coded and arranged into columns according to their electron configuration ... not according to Z. Ordinary ionization adds or removes an electron without changing the charge of the nucleus. An example of this process is featured in figure 4. Let’s think about the connections and relationships between the various ideas that we have been discussing, namely Aufbau, Abbau, isoelectronic correspondence, and ionization. Isoelectronic correspondence is a vertical move in this representation. The Aufbau and Abbau processes are horizontal moves in this representation. Ionization is a diagonal move in this representation. Similarly, the reverse of ionization, i.e. neutralization of an ion, is a diagonal move. Clearly negative ionization is not the same as Aufbau, and positive ionization is not the same as Abbau (i.e. reverse Aufbau). That’s because ionization just changes the number of electrons, whereas Aufbau and Abbau change the number of electrons and the number of protons together.